Ordinary number signature Sriwisarn EF about³ 2,400 - 2,500 baht. Ordinary number special code signature Sriwisarn UNC about 50,000 - 52,000 baht. The price was updated on 5th December 2017. 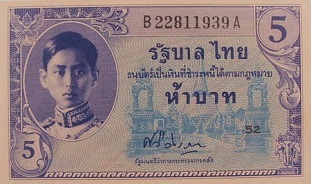 The 8th series 5 baht banknotes were printed from USA after the end of world war 2. The paper used was that used for banknotes that were used by the US army as currency in the areas under their control in Europe at the end of the war. The paper had a watermark "MILITARY AUTHORITY". After supplies of this watermarked paper were exhausted, plain paper were used. To make it easy to verify and prevent forgery, Arabic numerals from 1-70 were printed in black ink at the lower right corner on the front. 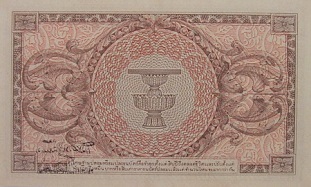 The 8th series 5 baht banknotes were announced on 21st November 1946.